My family and I attended the midnight opening of the final chapter to the Harry Potter series. Of course, this was an event. The movie slot sold out days prior, the crowds were large, all hands were on deck at the concessions stand, teens were dressed in their Harry or Hermoine costumes… it’s been a long time coming. For me, the enthusiasm that my kids (age 17 and 19) had for the midnight showing was bittersweet. They’re young adults now, and moments in which they act at least a little like kids are few. It was worth taking a day of vacation for the pleasure of a family event. A movie with “Part 2” in its title similarly chapters a transition with life with Harry Potter and whatever the next “big thing” becomes. But my kids grew up with Harry Potter, and I’m happy that it’s become part of the fabric of t heir youth. “HP-TDH Part 2” is about moving on just as much as it is a conclusion. 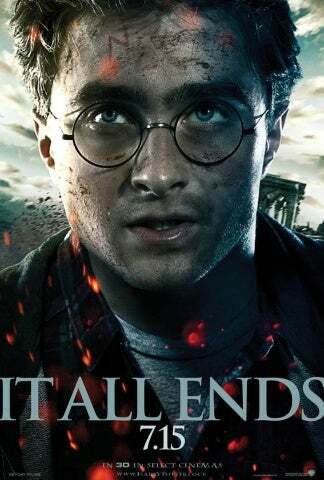 Harry Potter – Deathly Hallows Part 1 I found to be an engaging movie about the development and maturing of its central characters, as well as the artful way in which it was depicted. Rowling’s final book simply had too much content to fit into one movie, and while Part Two builds to the long awaited climax, the characters are already developed; the audience knows the final steps until He-Who-Shall-Not-Be-Named meets his necessary end. It’s just the visualization that awaits. Or is it? This isn’t just Part Two of a two-part movie. The characters have grown over the last seven movies (or the last 6 and 2/3rds books). But at its core, this final chapter is about Harry Potter. It’s not about Hermoine, Ron Weasley, Dumbledore, Snape, or even Voldemort. They’re all given their moments, certain to please fans with moments of humor, the culmination of developing relationships, redemption, or just desserts. But what Harry will we see? Will he be the uncertain, often overwhelmed chosen one? Will there be more “woe is me” whining, the “gee-whiz” novelty of magical experience, the frustrated angst of not knowing what to do, or the insecurity of fighting a seemingly unending uphill battle? Finally, Harry Potter is all grown up. His bravery has never been questioned. But here, he’s decisively heroic rather than a fortunate or accidental victor over circumstance. I don’t know that Daniel Radcliff was the best choice to play Harry Potter. But, he’s the Harry Potter we got, and in the final two chapters he pretty well owns the role. Some might wonder if the plethora of special effects overshadow the plot. No. They’re expected more in this film than any since the first introduction to the world of wizarding, and they deliver. We watched the 3D version, which added flavor without overplaying the experience, though the 3D glasses tended to sap the color out of this darkly toned movie. And then there’s Hogwarts, featured enough in this chapter to be considered a main character. Its rooms are familiar, it’s profile well sketched, its fictional existence likely as dreamt over as Santa Claus. Here, it’s destruction is saddening, and reconstruction of its remains are left to the imagination. But as Neville Longbottom’s “Braveheart” moment illustrates, the school is its people, and Hogwarts, and all its fans, are proud at the end.